Love apple pie but don’t want the hassle of baking one? 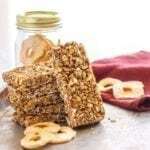 These Gluten Free Apple Pie Oatmeal Snack Bars are the answer! Perfect for dessert, breakfast, and on-the-go snacking. In a large mixing bowl, combine all dry ingredients (oats through spices). Place a small saucepan on the stove and pour in the brown rice syrup, almond butter and maple syrup. Turn the heat to medium and once the mixture becomes warm, stir constantly to create a smooth syrupy mixture. Once smooth and slightly runny (or after about 2-3 minutes of heating), turn off the stove. Add the vanilla, stir once more, then pour the contents of the saucepan into the mixing bowl. Place in the fridge overnight or in the freezer for a few hours until firm. Slice into 12 bars and wrap individually. Store in the fridge or freezer.